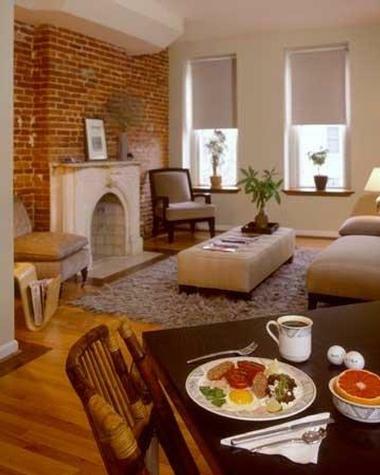 The Inn at 2920 is a contemporary bed and breakfast located in downtown Baltimore that offers guests a distinctive urban-chic experience. 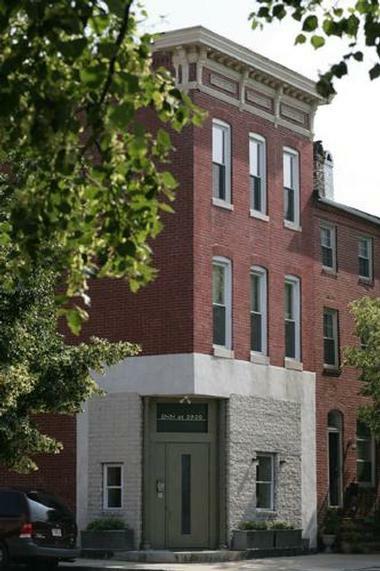 Nestled in the vibrant neighborhood of Canton, the Inn at 2920 offers comfortable accommodations for both business and leisure travelers, modern amenities, a fully-equipped business center and a comfy sitting room with a DVD library. 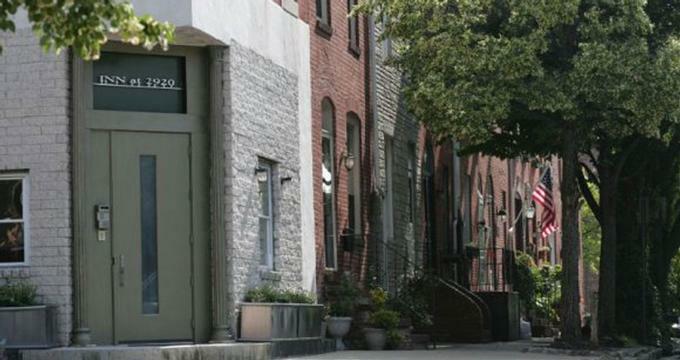 Ideally situated for exploring the city, the Inn at 2920 is only minutes away from popular attractions such as the Canton Waterfront Park, Inner Harbor, Fells Point, and an array of restaurants, pubs, and cafés. The Inn at 2920 offers stylish and contemporary guest rooms that have been individually designed and decorated to create unique havens for guests to enjoy. Well-appointed guest rooms feature private en-suite bathrooms with separate glass-enclosed showers, and Jacuzzi jetted bathtubs, plush towels and luxurious Gilchrist and Soames toiletries. Comfortable beds are dressed with imported 100% cotton linens and modern amenities, including flat-screen HD televisions with premium cable programming, DVD players, CD/MP3 alarm clocks, and complimentary high-speed wireless Internet. The Gato Casa is an elegant two-room suite that features a separate bedroom, living room, and full kitchen. The bedroom has a queen-size cherry wood platform bed with pillow top mattress, soft pillows, and 100% cotton linens and an en-suite bathroom has a limestone shower with Amazon rain showerhead, single vanity and luxurious Gilchrist and Soames toiletries. The spacious sitting area has bamboo flooring, comfortable sofas, a marble wood-burning fireplace, and large windows with beautiful views over the Canton neighborhood. A fully equipped kitchen has all the appliances and utensils necessary for comfortable holiday living and modern amenities include a flat screen HD television with premium cable programming, DVD player, CD/MP3 alarm clock, and complimentary high-speed wireless Internet. The Green Room features a beautiful walnut queen-size sleigh bed with Kingsdown mattress and 100% cotton linens, and an en-suite bathroom has a limestone shower with luxurious rain showerhead, a Jacuzzi tub, single vanity and luxurious Gilchrist and Soames toiletries. A comfortable sitting area features 10-foot high ceilings and has a work desk and arm chair, smooth bamboo flooring, soft lighting and modern amenities including a flat screen HD television with premium cable programming, DVD player, CD/MP3 alarm clock, and complimentary high-speed wireless Internet. The Room At the Edge of the World exudes a tranquil, aquatic ambiance. The room features a beautiful walnut queen-size sleigh bed with Kingsdown mattress and 100% cotton linens, and an en-suite bathroom has a limestone shower with luxurious rain showerhead, a Jacuzzi tub, single vanity and luxurious Gilchrist and Soames toiletries. A comfortable sitting area features 10-foot high ceilings and has a work desk and arm chair, smooth bamboo flooring, soft lighting and modern amenities including a flat screen HD television with premium cable programming, DVD player, CD/MP3 alarm clock, and complimentary high-speed wireless Internet. Named after the rich history of the house, another room features an ornate wrought iron king-size bed with pillow top mattress, soft pillows and 100% cotton linens, and an en-suite bathroom with a limestone-tiled shower, an oversized whirlpool bath, single vanity and luxurious Gilchrist and Soames toiletries. A comfortable sitting area features 10-foot high ceilings and has a work desk and arm chair, smooth bamboo flooring, soft lighting and modern amenities including a flat screen HD television with premium cable programming, DVD player, CD/MP3 alarm clock, and complimentary high-speed wireless Internet. 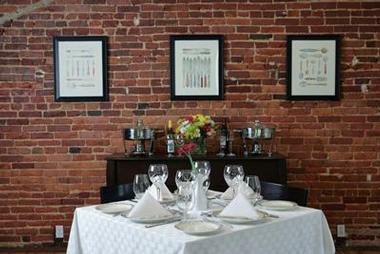 The Pomfret Room features a 12-foot high ceiling with huge bay windows overlooking the Canton neighborhood. The room has a beautiful walnut queen-size sleigh bed with Kingsdown mattress, and 100% cotton linens and an en-suite bathroom has a limestone shower with luxurious rain showerhead, a Jacuzzi tub, single vanity and luxurious Gilchrist and Soames toiletries. A comfortable sitting area features a work desk and arm chair, smooth bamboo flooring, soft lighting and modern amenities including a flat screen HD television with premium cable programming, DVD player, CD/MP3 alarm clock, and complimentary high-speed wireless Internet. Guests can indulge in sumptuous complimentary gourmet breakfast every morning, which is served in the comfortable dining room. Freshly prepared each morning, breakfast includes hot and cold choices ranging from fresh fruit, yogurt, cereals, homemade granola, oatmeal, breakfast pastries, and bread. Full signature hot meals include French toast, onion and herb quiche, beef sausages and potatoes, blueberry bread pudding, egg and potato bake, and toasted English muffins. Business travelers can grab something on the go – just request your choices the night before. 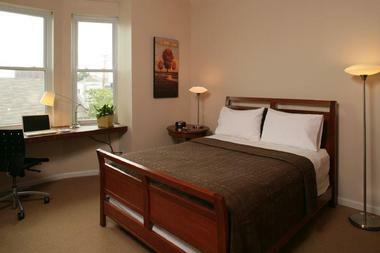 The Inn at 2920 offers modern amenities including a 24-hour business center with the use of a guest computer, limited printing access and copying and fax services, a comprehensive DVD library, and a variety of board games, books, and magazines for guests to use. The Inn serves complimentary hot and cold beverages and freshly baked homemade treats every afternoon, there are free on-street parking and complimentary high-speed wireless Internet throughout the property. The Inn at 2920 also offers free personal concierge services, including restaurant reservations, excursion and tour bookings and advice on attractions and activities in the surrounding area to enjoy. Extra guest services and amenities can be added for an additional fee, such as chocolate-covered strawberries and Bing cherries, fruit baskets with fresh seasonal fruits, fresh flowers and long-stemmed roses, freshly baked chocolate brownies and milk, cheese and cracker tray, and a selection of house wines, champagnes, and sparkling wines. Guests can enjoy full spa treatments at the nearby Zina’s Day Spa, which is located just a block away and offers a range of spa services, including massages, body treatments, manicures, and pedicures. The Inn at 2920 can accommodate a range of events from corporate functions and business meetings to intimate gatherings and social occasions. The Inn can cater for up to 16 people in the elegant lounge or dining room that are lovely locations for brunch, lunch or high afternoon tea. The same rooms can be reconfigured for larger groups of up to 45 people, with a full service bar and spacious sitting area for pre- or post-event cocktails and drinks. The sitting and dining room can accommodate up to 24 people for seated receptions or formal catered events, and the Inn can supply events planning team to help with the details of the event, such as audiovisual requirements, customized menus, and themed décor. The Inn at 2920 is also a perfect venue for business meetings and corporate functions for up to 25 people in an informal setting or boardroom setting. Guests can choose between the Gato Casa Guest Room, the 2920 Lounge, the sitting room or the elegant dining room to suit any needs. The Gato Casa Guest Room features a private bathroom and fully equipped kitchen and can cater up for up to 25 people in a boardroom setting or informal lounge while the 2920 Lounge can fit up to 25 individuals with a spacious sitting area and full service bar. The spacious room offers an informal or a boardroom setting for up to 12 people, and the dining room offers table seating for up to 12 people or eight people in a casual boardroom setting. For larger group retreats, the Inn can be rented out in its entirety as an overnight retreat with luxurious accommodations, delicious breakfast, modern business center and amenities, and personalized concierge services. Baltimore is the largest city in Maryland and packed with an array of attractions and things to see and do. 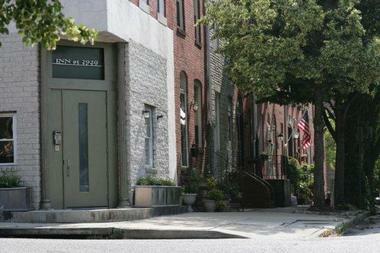 The city is home to an array National Register historic districts, some of which were the earliest in the nation, such as Mount Vernon Place, Federal Hill, and Fell’s Point, and has more public monuments than any other city in the country. The Inn at 2920 is nearby to several notable attractions including the Pier Six Pavilion, which plays host to a variety of music concerts and events, from rock to jazz and from R & B to classical, throughout the year. The Harbor Place at Inner Harbor features a unique mix of shops, restaurants and live seasonal entertainment on the waterfront. A few miles from the Inn is the Oriole’s Park at Camden Yards, home to the Major League Baseball team, the Orioles, as well as Raven’s Stadium, which is home to NFL team, the Ravens. The birthplace of the country’s national anthem, Fort McHenry, is just four miles from the Inn while the Green Mount Cemetary has a significant place in history as being the final resting place of Elizabeth Patterson Bonaparte and John Wilkes Booth. The vibrant Lexington Market is just three miles from the Inn and is a beautiful place to stroll around soak up the sights, sounds, tastes, and aromas of the cuisine and energy that makes Baltimore the city that it is. Read more: Weekend Getaways from Washington, DC and Best Things to Do in Baltimore.